Happy new year everyone! 2011 was a great year for us, despite the fact that there were so many tragedies happened in our country we are still here strong and happy. ousemates in Anawim. Last November, i actually posted in my facebook page that we are looking for a place that we can give donation to. My friends were all delighted and gave their suggestions, thank you because we placed it in our list so that we can consider it for December 2012. I personally selected Anawim Lay Missions because i wanted to help people who does not have any choice already in life and these are the elderly people in Anawim. 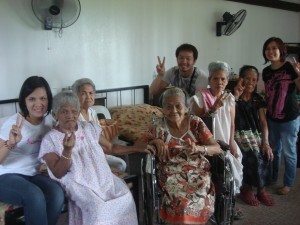 Lola Victoria(center), 100 years old! We were told by the guide that most of the Lolos and Lolas here are single, no kids to take care of them , and sometimes abandoned by their own family. Each of them has their own stories of trials, bravery and misfortunes. Currently there are 44 elderly housemates in the center. Some are still walking and some are bed ridden already. 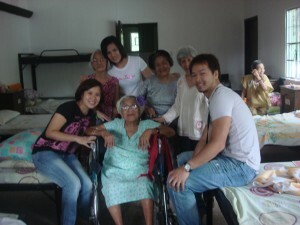 The oldest housemate is Lola Victoria, she’s still healthy and she even sang for us! that she can still teach even today. We noticed something in common to all Lolas, almost all of them suffer from osteoporosis, there toes were really awkwardly bent, i couldn’t imagine how it can it possibly happen. I hope the milk that we gave can help can help. Giving, sharing, helping , whatever term we want to call it, its priceless, the heartbeat i felt in me was different, its unexplainable! an outreach for your company or for yourself in Anawim, please click here.